Foreign policy is one of the areas that President Trump has been too controversial during his one year in the office. The National Security Strategy (NSS), released on December 18, was a great opportunity as a single text which tries to give a holistic view about the White House’s conception of foreign policy. The NSS defines threats, expectations from allies and the issues that the administration give emphasis. Therefore, the document can be helpful to shed light on the future of Turkish-American relations although it doesn’t mention Turkey’s name, unlike last two NSS documents in 2015 and 2010. As regional threats, rogue states, primarily Iran and North Korea, are handled in the document. Mentioned 17 times in the NSS, Iran, with sectarian militias in all around the Middle East, expansionism and nuclear and ballistic program, is the main challenger of the United States in the region. Regarding terrorism, in addition to security and military issues, the document gives also emphasis to the ideology of the ‘radical jihadist terror,’ like ISIS and al-Qaeda. In the light of either Trump’s or his aides’ dislike of political Islamism, it promises more decisive actions towards political Islamist groups, mainly the Muslim Brotherhood. On the other hand, the most important feature of the document is its emphasis on a global rivalry. Depicting China and Russia as ‘revisionist powers,’ it is possible to say that the NSS implies a hegemonic struggle between the United States and its challengers, China and Russia. China’s military modernization – economic expansionism and Russia’s ‘new military capabilities’ – ‘modernized forms of subversive tactics’ are the instruments that the revisionist powers use to undermine American superiority. Within this scope, in order to reverse the decline of American influence, the NSS promises to fight back against these traditional and emerging threats. However, it is not good news for Turkey, a NATO member and a traditional American ally in the Middle East. 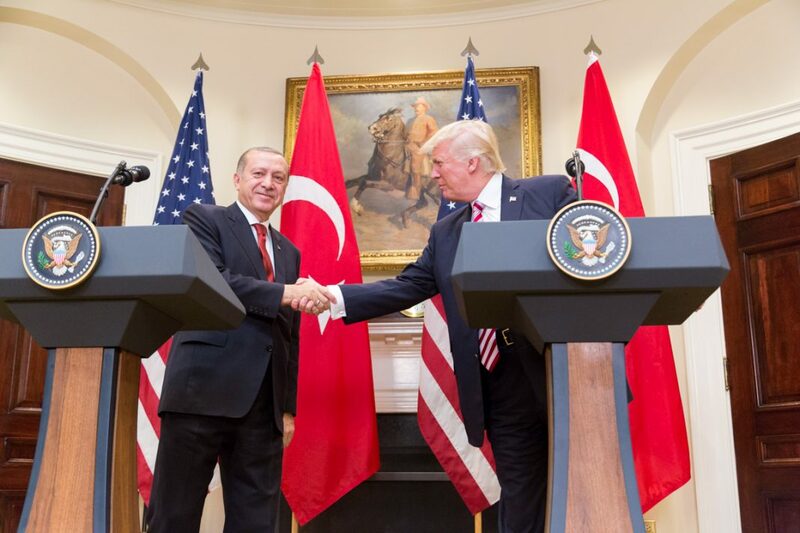 Today, Ankara’s relations with Iran, the Muslim Brotherhood and Russia are stronger and more effective than Turkish-American ‘strategic partnership.’ In other words, in the NSS’s friends and foes division, Turkey stands on the wrong side. In regional politics, Turkey moves as the third partner of Moscow and Tehran, especially in Syria. Moreover, Ankara was purchasing a NATO-rival missile defense system, Russian S-400, and thus strengthening military relations with Moscow in expense of NATO. On top of it, both political Islamism and Dogu Perincek‘s ultra-nationalism has been promoting anti-western and anti-American sentiments in Turkish society. In this respect, the NSS may be the sign of a revolutionary change in Turkish-American relations. Neither Trump’s rhetoric nor the NSS document give hope for the U.S.’s dedication to democratic values and human rights in foreign policy. National interests and realism, rather than moral values, have more share in the current American decision-makers’ mindset. In his famous Riyadh speech, President Donald Trump had openly declared his ignorance to moral issues, like democracy and human rights. “We are not here to lecture – we are not here to tell other people how to live, what to do, who to be, or how to worship. Instead, we are here to offer partnership – based on shared interests and values – to pursue a better future for us all,” said President Trump. Needless to say, it is bad news for people who expects a strong American reaction to Turkey’s worsening democracy and human rights records. Having said that, in the context of Turkish foreign policy, democracy and human rights are not only a way of a good governance, an ideal or a moral value. They are also beacon of Turkey’s attachment to the western alliance and notably its alliance with the U.S. Turkey’s alignment to the West has been the driving force for democratic and humanitarian reforms in Turkey. In parallel, deterioration of democracy and human rights records coincides with loosening of Turkey’s relations with the West. In this respect, it is possible to say that democracy, rule of law and human rights in Turkey really matter in Washington. There are many other critiques in Washington toward Turkey’s implicit relations with terrorist organizations or its alliance with Russia and Iran at the expense of the U.S. Therefore, a famous Turkish journalist, close to military and diplomatic bureaucracy, writes that inexistence of Turkey’s name in the NSS actually pleased Ankara who was fearing to be targeted in the document. Economic and diplomatic tools emerge as Washington’s possible instrument to put pressure on Ankara. The NSS document states “Economic tools – including sanctions, anti-money-laundering and anti-corruption measures, and enforcement actions – can be important parts of broader strategies to deter, coerce, and constrain adversaries. We will work with like-minded partners to build support for tools of economic diplomacy against shared threats. Multilateral economic pressure is often more effective because it limits the ability of targeted states to circumvent measures and conveys united resolve.” In fact, Reza Zarrab – Hakan Atilla trial in New York can also be interpreted as part of this policy toward Turkey. Again, suspending visa applications from Turkey mirrors Washington’s intention to seek its interests through diplomatic and economic tools against Ankara’s rogue actions. Therefore, economic instruments and diplomatic marginalization in international community, is the likely reaction which will Ankara face as a result of massive right violations at home and acting as a rogue state abroad.